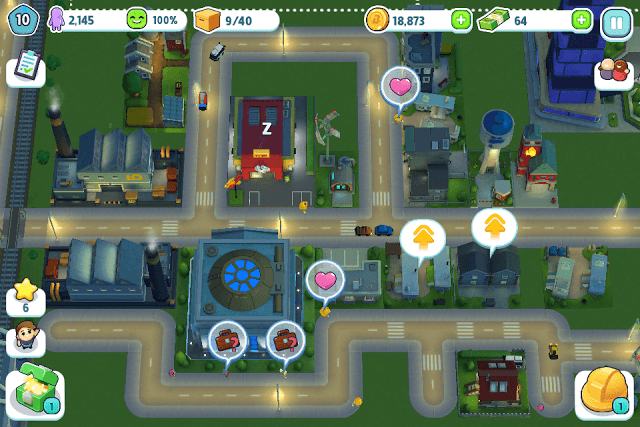 Gameloft’s City Mania puts you in the shoes of a mayor and lets you build, expand and manage your dream metropolis. 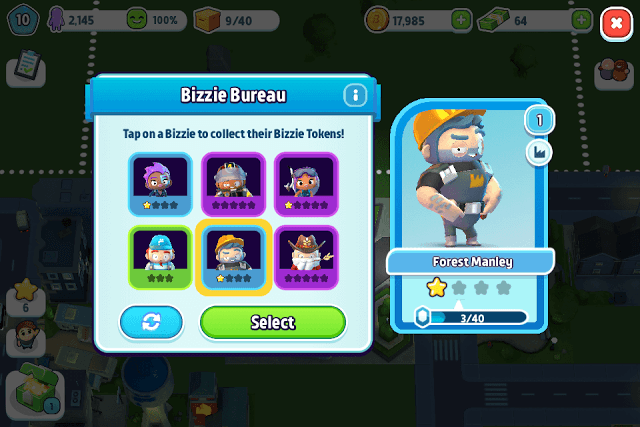 By introducing interesting characters called “Bizzies”, the game aims to be unique from other city builders. 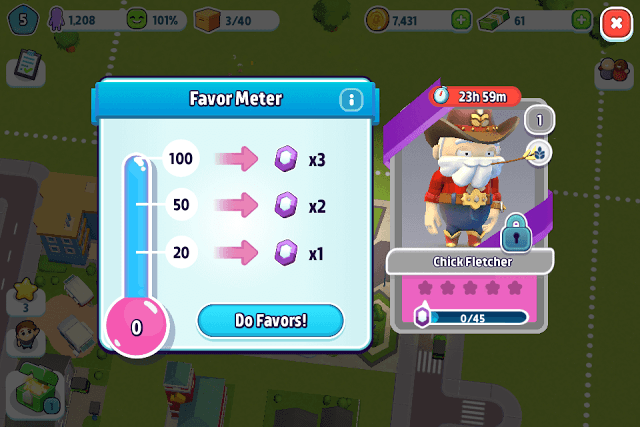 You can collect funny characters and use them to increase production, population and boost happiness in your city. Those dotted lines on the outskirts of your metropolis are your city borders. You cannot build any units on the other side of it. However, you can expand your city to extend the border when you don’t have enough space to build more units. 1. Send your bizzie on a rare item hunt mission. 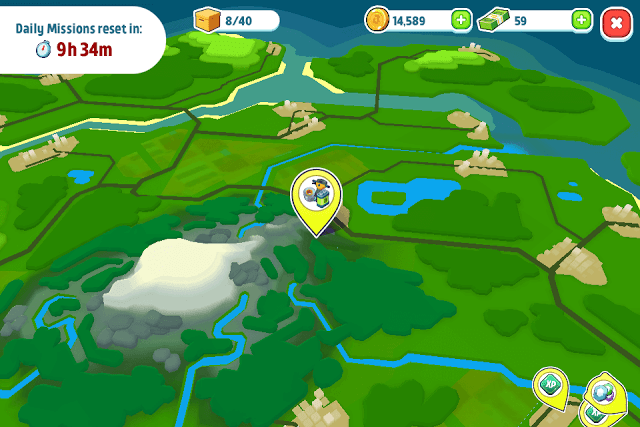 Tap the missions building (the one with a dish antenna) and look for the rare item mission icon on the map screen. Tap the icon and then press the start button. You will need to assign a character whose perks matches with the mission’s perk to increase success chances. 2. Spin the “Lottery” and you might get a rare item. Rewards also include coins and cash. Tap the drive-in theater to access the wheel of fortune. You will have to watch a short video before you can try your luck. 3. Keep building and upgrading houses to collect XP. The more XP you collect, the faster you will level-up. You will get rewards, such as crates, cash and rare items when you level-up. 4. Look for the gift box icon above a worker and tap it. Gift boxes may contain rare items. 5. Complete quests under “To-Do Lists” to get Rare Crates (Blue). Such crates usually contain items. Visit the crate house to get a free crate. It also contains rare items. This crate house is located next to the buyer’s marketplace. They are tiny hard-working characters who can assist you in building your dream city. They need to be assigned to buildings, such as factories, services buildings, even houses to get extra benefits and production boosts. For example: Assigning factory workers like Forest Manley to a small factory unlocks an additional production slot. This is because he possesses a special bonus called Crafty that lets you unlock another slot. Each worker offers unique bonuses to a specific building that can augment production of a factory or service building or boost happiness and population if assigned to a house. You just cannot assign any worker or serviceman to a house, factory or a service building. The building type should match his/her role. A bizzie can be a factory worker, hardware store clerk, electrician, firefighter, farmer, gardening store clerk, education specialist, police officer, sewage worker, doctor etc. So if you want to assign a character to a small factory, make sure that he should belong to the “factory worker” role. To know a character’s role or type, tap the icon located just above the crate icon at the lower left corner of the screen. A list a cards will be displayed on the screen. Tap the role symbol, which is located just below a character’s level. Each type is denoted by a symbol – An electrician will have a lightening symbol, a building manager (can be assigned to houses) will have a house symbol and a water treatment worker will have a water symbol. Tap the crate building to get a free green box. You will have to watch a video first to earn it. The free crate contains tokens for common workers and currencies. Collect currencies from crates, lotteries, to-do tasks and level-up rewards and save them to open the blue crate, which contains rare tokens. Complete tasks in to-do list to get crates. Tap the checklist icon at the upper-left corner of the screen to get a list of tasks and try to finish those that offer rare crates. 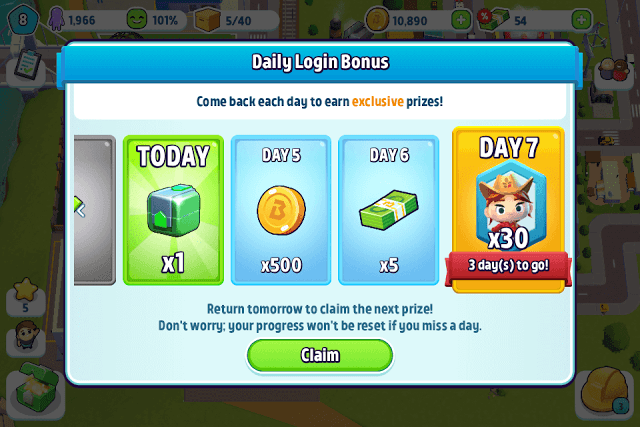 Play the game every day to get Daily Rewards. You can get crates and tokens. Your progress won’t be reset if you miss a day. If you have just started playing, you will receive 30 tokens on day 7. Level-up to get crates. To Level-up, keep constructing and upgrading houses to get XP. Drag materials that are required to build or upgrade a house. Look for the upgrade icon above each house and tap it to know what materials are required to upgrade them. Note the upgrade rewards at the bottom of the screen. Usually, you get coins, population and XP. Build and visit the Bureau every day if you want to gain tokens for a worker of your choice. Tap the building and then tap a bizzie that you want to unlock or upgrade. Next, Tap the Select button. If you don’t want the current list, you can always shuffle it by tapping the blue button beside the green “Select” button. You will have to wait for a few hours to get a new list of workers. On tapping “Select”, a Favor Meter will appear. Tap the Do Favors button and look for heart icons above workers in your city. Tap those icons to complete their tasks and win favors. Collect favors (hearts) to earn tokens. The meter will tell you how many hearts you will need to get a token. Make sure you complete tasks quickly to earn as many hearts as possible as favor tasks for your chosen worker will expire after 24 hours. Before constructing special buildings such as factories, fire stations and parks, make sure you have placed them where they belong to. You cannot place a manufacturing unit close to houses as the smog can cause inhabitants to flee from that area, which will decrease the happiness meter. Placing parks increases happiness of nearby buildings and constructing fire stations close to houses protects them against accidental fire. Some special buildings have a limited range, which is denoted by the number of tiles and color. 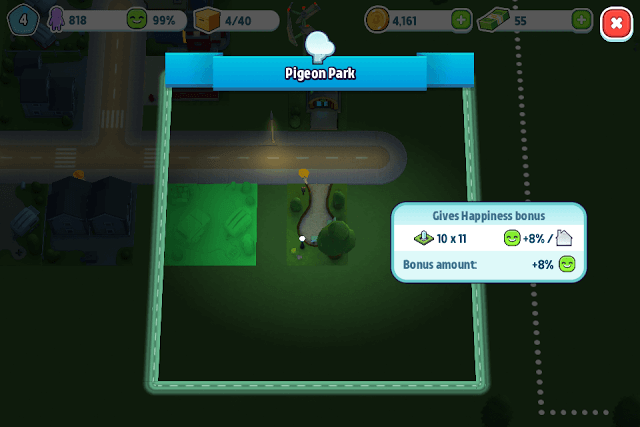 Just tap and hold down on a special building, such as a park, to know its range (shown in green). All houses within this range will get a happiness bonus. When you tap and hold down a factory building, the range color is dark brown. Don’t place any residential houses within the factory range as the smog will force citizens to abandon their homes. Try to create a separate area for factories (don’t forget to build roads first and then construct buildings or move them near roads). The game has already created a separate section for factories, but later you will need to expand the factory area to place more industrial units. Before constructing houses, make sure you have constructed roads. 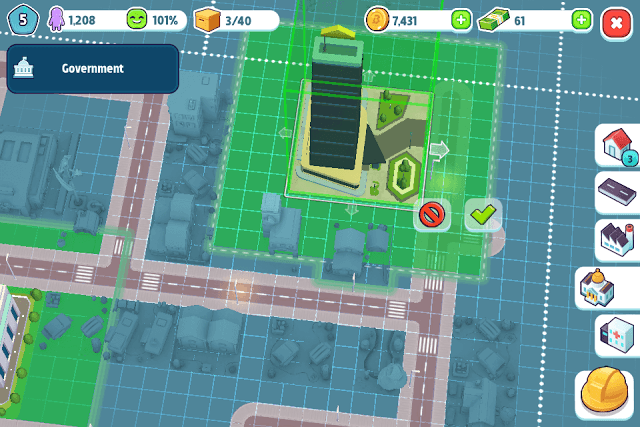 In City Mania, a building, such as factories and houses won’t be activated unless it has been connected with a road. If you construct a building first and then build a road around it, you might find it difficult to connect them. The best option would be to build a road and then drag a building close to it. Your building will automatically rotate and attach itself to the road. The borders of a building turning green indicate that it has been successfully attached itself to a road. Plan ahead before creating a network of roads. You will need to ensure that maximum buildings can be connected with them. A big circular pattern for a road can be a good idea as several buildings can be constructed around it. Not feeling creative or falling short of ideas? Well, why don’t you visit mayors around you to know how they manage their cities? Just tap the social icon located just below the pause button on the upper right corner of the screen. Now wait for the “Friends List” to load and then tap the airplane icon beside a player to enter his/her city. The friends list populates random players who are located near your city/area. You can only view a player’s city and cannot interact with buildings, but you can surely take inspiration from his work.